Todo lo que tiene que hacer la OTAN ante el paseíto de un avioncito ruso ... (**** por siaca). En serio, Putin le ha dado otra dimensión al gran oso ruso. Parece que las autoridades suecas siguen tomando el incidente con mayor preocupación de la que Ud. sugiere, pues el gobierno va a incrementar su presupuesto de defensa en $1.18 billones durante el periodo 2016 - 2020, con un foco especial en recuperar capacidades de guerra antisubmarina (y por suerte "... era evidente que allí no había nada que encontrar, mucho menos [submarinos] rusos", sino imagínense lo que se estarían gastando!). El factor ruso les sirve para justificar el aumento en su presupuesto de defensa, sea con "submarinos fantasmas" o no. Se estrella Mirage2000 Griego durante un supuesto dogfight con avion Turco. MILITARY forces from 31 countries took part in Nato's largest war games since the Cold War, in an exercise branded “insane” and provocative by one critic. Stretching from the Baltic Sea to Iceland, military manoeuvres were practiced close to Russia, which itself held a huge military drill last month. The Nato exercises played out a hypothetical scenario that involved restoring the Scandinavian country's sovereignty after an attack by a "fictitious aggressor". Peace activist and author David Swanson, told Radio Sputnik the drills were "madness", and argued it was no longer clear what Nato’s true purpose was. Swanson pointed to a petition at RootsAction.org calling for an end to military exercises that had obtained over 10,000 signatures. The exercises involved 50,000 troops, 250 aircraft, and 10,000 tanks, trucks and other land-based vehicles, and were headed by US admiral James Foggo. Foggo said: "We're here now, in the north, demonstrating our capability to bring a large force to bear on a problem that is an Article 5 problem” - referring to the Nato treaty's promise of mutual defence among member countries. Dubbed Trident Juncture, the exercise is by far the biggest in Norway since the early 1980s, a sign that the alliance wants to sharpen its defences after years of cost-cutting and far-flung combat missions. The exercises will continue over the next two weeks, in which troops will be tested against unforgiving environments. In a joint op-ed published Thursday in Dagens Nyheter, one of Sweden's largest newspapers, the Nordic defence and foreign ministers said they saw "no military threats against the Nordic countries today, but we live in an unpredictable and uncertain time. "Russia has both shown the will and ability to use military force to achieve strategic goals. If Nato and Russia are playing at intimidation, they both guilty for raising tensions. Last month Russia held its biggest manoeuvres since 1981, called Vostok-2018, mobilising 300,000 troops in a show of force close to China's border which included joint drills with the Chinese and Mongolian armies. Nato's war games were originally meant to involve 35,000 troops, but that number has grown in recent months and included the late addition of an aircraft carrier, the USS Harry S. Truman with some 6,000 personnel. Nato fears Russia's military build-up in the region could ultimately restrict naval forces' ability to navigate freely, and on October 19 the Truman became the first American aircraft carrier to enter the Arctic Circle since before the fall of the Soviet Union in 1991. The first event—featuring Norwegian tanks using a floating bridge to cross a river—was filmed 10.31.2018. The second piece of footage—featuring USAF F-16 fighter jets taking off at Kallax Air Base, Sweden—was filmed 10.26.2018. The third training exercise—which includes light armored vehicles and amphibious assault vehicles with the 24th MEU—was filmed in Alvund, Norway 10.30.2018.
Credit: NATO and the U.S. Department of Defense (with derivative editing work from UMC). When: from 25 October to 7 November 2018.
Who: Around 50,000 participants from 31 NATO and partner countries. Components: Around 250 aircraft, 65 vessels, and up to 10,000 vehicles. Location: Central and eastern Norway; the surrounding areas of the North Atlantic and the Baltic Sea, including Iceland and the airspace of Finland and Sweden. Objective: To ensure that NATO forces are trained, able to operate together, and ready to respond to any threat from any direction. Poticuadrados y Cafeteras guidoum meiquers, incluidos. Ese despliegue ha hecho que se note aún más la pobreza de lo que fue 'Vostok' en septiembre de este año y 'Zapad' en 2017. 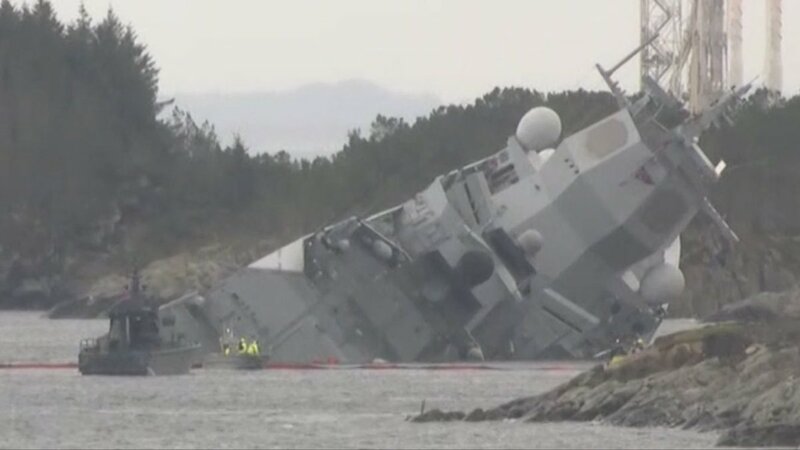 Fragata noruega KNM Helge Ingstad (F313) después de sufrir una colisión con un buque cisterna. Hay heridos y temor de que termine hundiéndose. La clase 'Fridtjof Nansen' es construida por Navantia. Cinco sirven en la Armada Real de Noruega. Last edited by ChrisBV; 08-11-2018 at 06:44 PM.